Safety in numbers for cyclists in Dublin City? 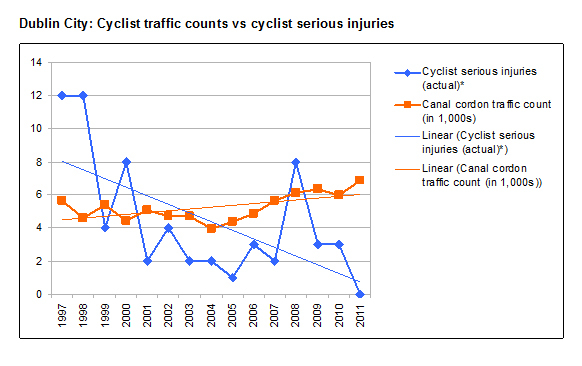 Data and limitations: The 2011 data for serious injuries is provisional. While all deaths are significance, the numbers of deaths and injuries are so low that the data on such may be not “statistical significance” to analyse. It is worth noting that given that the figures are so low, small increases in the death rate may occur in the future. Further detail and discussion on the death and injury figures can be found here. The Dublin City Council canal traffic counts data is the only available data for yearly changes in the volumes of cyclists in Dublin (automatic counters have been put in place at limited amount of locations around Dublin, but only recent data is available). With a recent marked increase in cyclists on Dublin City roads road (45% more cyclists entering central Dublin since 2006, 26% more regularly cyclists since 2006 across Co Dublin, and 5,000-7,000 Dublin Bikes trips a day since September 2009) if the death and injury rate had remained stable, such would represent a decline compared to the amount of cyclists. Thus the recorded data shows a notable decline, in percentage and actual terms. Analyses/discussion: It may not be possible to firmly linked the rise in cyclists numbers and the death and serious injury rates, but we can say that it is clear that an increasing amount of cyclists does not mean higher deaths and serious injuries, and that it can mean fewer deaths and serious injuries. Where a link between an increasing amount of cyclists, and a reduction in the death and injury rate has been established, it is called the “safety in numbers” effect. 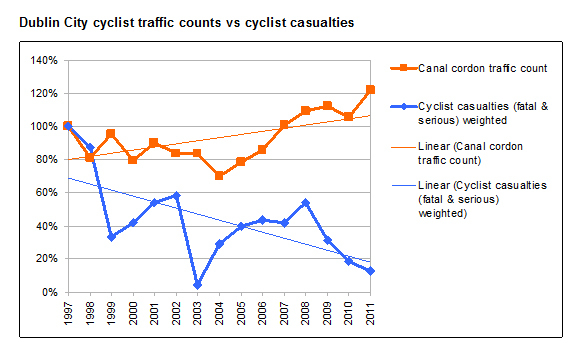 Does the above data show safety in numbers for cycling in Dublin? Similarly, the increase of cycling in Dublin has been accompanied by complaints from cyclists and non-cyclists that most or many new and/or current cyclists are somewhere between inexperienced and reckless  . 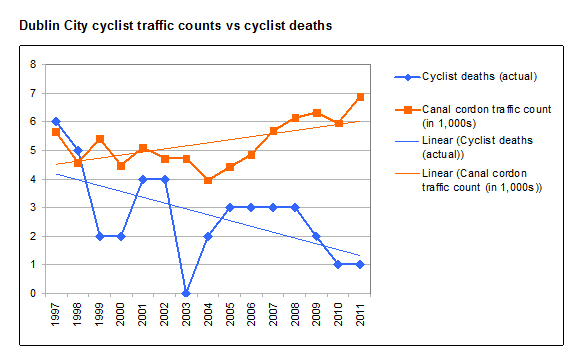 However, despite an increase of inexperienced cyclists on Dublin’s road, the data shows that the death and injury rates have not increased. The opposite has happened, death and injury rates have continued to decline. Conclusion: If cyclists in Dublin are as reckless as it is report and there has been a marked increase in inexperienced cyclists on the roads, cyclist behaviour seems to have little to do with the death and injury rate. Motorists seem to have adjusted their behaviour to an increasing amount of cyclists around them. I have found the best time to Cycle on Dublin Streets are between 10.30am – 4.30pm in the quieter times. In the rush hours in morning and evening it is quite chaotic and dangerous particularly on certain Streets and you always have to take care. There is a big problem with those Buses who seem to like travelling in groups of at least four. If you happen to travel along Dame Street then Westmorland Street -O’Connell Bridge it can literally get blocked by a fleet of Buses. I was travelling back to the NTH side recently and was passing Bank of Ireland and was suddenly blocked by a wall of Buses. But as I was on a Bicycle as were others we were able to negotiate our way through the Melange. They the Buses were five abreast along Westmorland Street,I would say could be 40 or even Eighty Buses. Beyond O’Connell Bridge no Traffic at all. When these Buses start to move you have to be very careful not to get trapped by them. There are Bus Lanes all over the City ,why not along this strip badly needed. Something needs to be done about these very wide multi Lane Streets,cars travelling on them at fast speeds,very hard to get over to the right to turn with Traffic flying by. Needs to have Lights that go green for Cyclists to enable them to turn right at the next junction. Drivers not respecting the 1.5 metre passing distance or even the 3ft distance,they seem to play the game of getting as close to the Cyclist as possible. There are some Cyclists taking chances passing moving Buses on inside very close to the Curb,others going through red lights either very fast or creeping across. In spite of all this very few Deaths or bad injuries lately,it just keeps going down with every year. While Motorists are still suffering fatalities and bad injuries around 300 although they mostly seem to be single Car Accidents on lonely Country Roads. John: From a mix of the figures and my personal experience, I can’t accept rush hour cycling is very dangerous — it’s when most people cycle! In general, I’ve cycled in Dublin for about five years and drivers have gotten a lot better around cyclists in those years. But I agree that multi laned streets need to be changed and roads in general could be a lot more cycling friendly. Regarding the previous two comments, I think there’s a difference between danger and chaos and corresponding accidents. It’s possible to be theoretically more dangerous, but also as a result of a more alert cyclist, result in less problems. That doesn’t help a beginner or unconfident cyclist though. My preffered mode of transport around Dublin is bicycle. I would go as far as to say that I am an experienced cyclist but I have to say I do find Dublin rush hour traffic intimidating while on my bike. Often I choose to walk home instead. What I am saying is at rush hour you have to be very careful,you cannot relax and have to be prepared to stop . Traffic has the rather annoying habit of trying to rush past on the inside and you have to constantly watch out for this. Where there are Traffic Islands in the Centre of roads Traffic tries to rush ahead in two’s often not seeing the Cyclists in their haste. I have Cycled all my Life and I have never been deterred by the heavy Traffic in Dublin but it is very annoying at those times.